Environmental organizations are urging everyone to play their part in conserving and protecting our Mother Earth. One of the easiest ways to contribute to this is by consuming less energy daily. Contrary to the popular notion that solar panels are costly, many affordable prices of solar panels in the Philippines are available to urge the Filipino people in switching into an energy-efficient living. Choosing to consume less energy will provide many positive impacts to both people and environment. Now is the perfect time to join the conservation movement and start opting for energy-efficient appliances. To convince you to make the switch to the sustainable lifestyle, here are the top beneficial reasons to make your humble abode an energy efficient one. One of the most appealing benefits of consuming less energy is the opportunity to save money. For example, opt for light-emitting diode (LED) bulb because it only uses 2 to 17 watts of electricity. It can also last longer than the other types of bulbs, so you don’t have to constantly replace your bulbs. Making various energy-efficient home improvements will enable you to do your part in reducing energy consumption and lessen your monthly expenditure as well. Fossil fuels are burned in order to produce energy, but it also has negative side effects to the environment. The burning of fossil fuel produces heat-trapping gases, which is the primary cause of global warming. When you consume less energy or install solar panels at home, you can reduce the need to burn several fossil fuels. You may argue that it’s just one home against millions of others, but it’s a start. Carbon footprint refers to the environmental impact of a certain individual to the environment. Carbon footprint has two types—primary and secondary. The primary footprint refers to all the carbon dioxide emissions created when fossil fuels are burned. The secondary carbon foot print refers to the indirect carbon dioxide emissions formed through manufacturing or breaking various products. Opting for energy-efficient appliances, such as LED or CFL bulbs or simply unplugging home appliances when not in use are simple steps in reducing your carbon footprint. 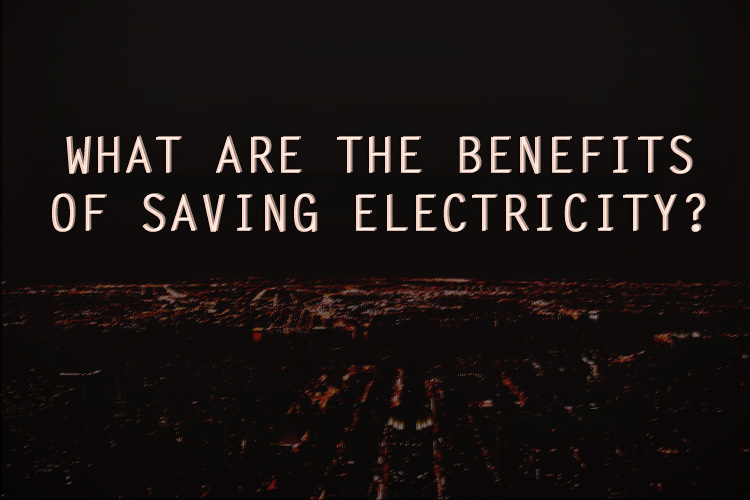 All the benefits mentioned above just boil down to one of the most important benefits of saving electricity— the conservation of the environment. Consuming less energy or cutting back on the electricity use will lessen the need for the production of energy. Then, there will be a lesser carbon dioxide emissions that will contribute to the climate change. Thus, it will create a cleaner and healthier air. Doing more with less energy is definitely beneficial for people and environment. Starting to save energy does not have to be complicated nor expensive. There are several easy ways to reduce your carbon footprint without having to bend over backwards. Simple energy-saving habits, such as turning off the lights when not in use and turning down a water heater are already big help in the environment and for you as well.